"The story of a regular guy just looking for a little wreck-ognition." In "Wreck It Ralph" (Disney, 2012), fans of video games (or storytelling, in general) will appreciate this 3D computer-animated film. As the story goes, a video game villain, Wreck It Ralph (John C. Reilly), wants to retire from his "bad guy" role. He's tired of being a force of destruction (he wrecks a geometric, 1980's style digital building until "good guys" save the day and fix it). Rather, Ralph wants to be heroic and loved, or at the very least, a normal guy. But, when Ralph expresses his desires to his villain support group, he finds no empathy. His villain peers see no problem with being a villain -- and Ralph finally sees himself outside of both the hero and villain world. Thus, his personal quest begins. This is when Ralph takes his big, bold move: he decides to leave his very own game. To the shock of the game's fans, Ralph mysteriously disappears from the screen has has inhabited for three decades, and he traverses into other games of the arcade. One of these lands is a kart-racing game, with candy-land-like design, in which he meets the character Vanellope (Sarah Silverman). In these games, he not only interacts with but also helps characters. Other worlds and settings are included. Through these various games, Wreck It Ralph finds that he must eliminate a threat, the Cy-Bugs, that can take over any game they enter. These Cy-Bugs propose a huge problem, as they that could bring down the entire arcade. Worst of all, they may be a threat that Ralph inadvertently created. It then becomes Ralph's quest to stop the evil Cy-Bugs. As he confronts everything from mountains to castle prisons, he takes on a role to save the arcade -- and, in a sense, become a hero. But does he need to be a "hero"? What is a "hero," anyway? And how can Ralph define himself? These are the questions brought into play in "Wreck It Ralph," an endearing, family film about the roles we assume in life. As Ralph traverses through games, and as he interacts with heroes, villains and all in between, he sees the roles that everyone assumes, and those that he hopes to transcend. But, more than anything, he comes to hold a greater understanding of himself, which grants deep humanity to this colorful comedy. This is a touching, highly watchable film, recommended for all ages. Other stars include Jack McBrayer, Jane Lynch, Alan Tudyk and Adam Carolla. 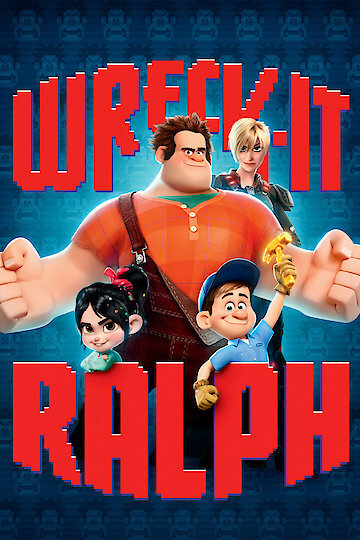 Wreck-It Ralph is currently available to watch and stream, download, buy on demand at Amazon Prime, Starz, Vudu, Google Play, FandangoNow, iTunes, YouTube VOD online. A few days ago we showed you the trailer for Disney's Pixar-esque new movie "Wreck-It Ralph." Now Disney is marketing the video game movie with a video game from the movie? That makes sense, right? Click through to play the game. Could Disney's 'Wreck-It Ralph' Be Better than Pixar? Watch the Trailer! Take one part "Tron" and one part "The Incredibles," add an extra splash of adorable and a great voice cast that includes John C. Reilly, Jane Lynch and Sarah Silverman, and you have "Wreck-It Ralph," the latest movie from Disney and one that might actually rival Pixar. Watch the trailer here!